A mainstay at Manchester United for almost nine years now, Antonio Valencia is arguably Ecuador’s greatest ever footballing export. Whilst rarely the star of the Red Devils’ side, Toño has shown great consistency, staying power and versatility to remain a regular at one of the world’s biggest clubs. If he’s not always received the praise he often deserves in England, back in Ecuador it’s a different story. Still the talisman of the national side with 92 caps to his name, his actions and words carry considerable weight. So when he took to Twitter to praise the performances of Independiente del Valle’s latest starlet Billy Arce, you know it’s worth sitting up and paying attention. Named as the Ecuadorian Footballers Association young revelation of 2017, the electric 19-year-old winger has had a breakthrough year, scoring 12 goals in 32 appearances in what was an otherwise disappointing campaign for Independiente del Valle. What makes those stats all the more impressive is that Arce wasn’t even a regular starter, often preferred as an impact player from the bench. Hailing from the northern coastal region of Esmeraldas that has produced players such as Enner Valencia, Walter Ayovi and Miller Bolanos, Arce has all the characteristics associated with the footballing hotbed. Quick, skillful and direct, he was picked up by Emelec in 2012 but only played 4 games for their U14s before switching to Independiente del Valle. Known for their excellent youth development, los Negriazules have produced numerous internationals such as Jefferson Montero and Juan Cazares to name but a few and were surprise Copa Libertadores runners-up in 2016. Along with fellow prospects Michael Estrada and Gabriel Cortez, Arce looks to be the latest off the never-ending conveyor belt up in Sangolqui. Usually used as an attacking winger or wide forward on the left, Arce has a natural tendency to drift in-field onto his favoured right foot. Blessed with searing pace, direct running and bags of flair, Nepito – as he is nicknamed – is therefore the perfect fit for the modern inverted winger role. Arce is just as capable making these incisive runs from the right-hand flank and enjoys being involved in the play centrally, but coming in from the left gives him more of a chance to get a shot away. As his stats attest, 12 goals is a very handsome return for a winger and many of these directly resulted from him skipping round players as he cut in from the left. In the first example we see Arce beginning in a position on the left wing and making a run in behind the defence to collect the long ball. Now inside the box and with a defender coming across to cover, Arce pushes the ball inside onto his right foot to go in-between the two closest defenders. The covering defender is wrong-footed and falls over, allowing Arce to drift inside and unleash an emphatic finish. His run also draws another defender, who has to leave his man unmarked as he tries to deal with the more immediate threat of Arce. You could argue that Arce should square the ball to his unmarked striker but his finish justifies the decision to shoot. In this second example we see a more congested pitch for Arce to operate in. First, he pops the ball off to his teammate and curves his run in-field behind the midfielders to receive the ball in front of the defence (point 2), which lures one defender out of the back line. Arce continues his run in-field and, with the next defender caught in two minds as whether to engage or not, gets a shot away which is deflected in past the keeper. 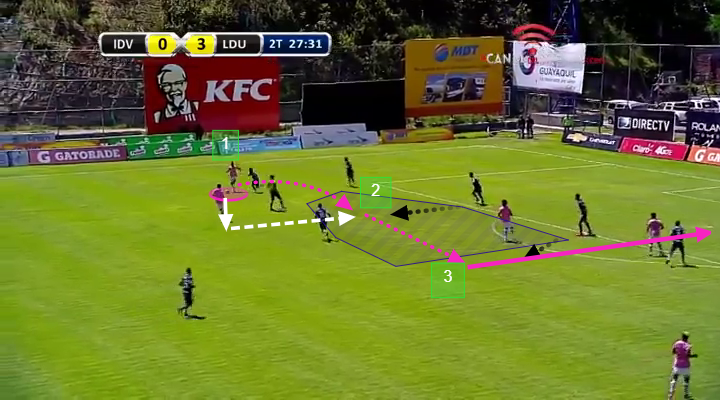 In the third situation we see an example of Arce cutting in from the right flank this time. Using his pace and power he drives inside and darts in towards the gaping hole on the edge of the area. As his marker can’t get near him, the opposition midfielder notices the danger and tracks back to make a challenge but can only bring him down, giving away a penalty. It looks like the tackle might just be outside the box but nevertheless illustrates Arce’s danger when making runs from the flank. Whether cutting in from the flank or hugging the touchline, Arce has the acceleration and pace that terrifies full backs. This speed and width makes him a potent force for teams playing on the counter or against a high defensive line. 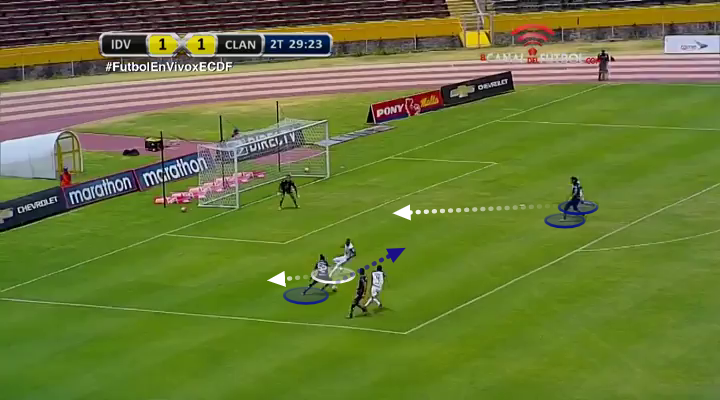 In the image below we see Arce’s in full flight during a typical Independiente del Valle counter-attack. 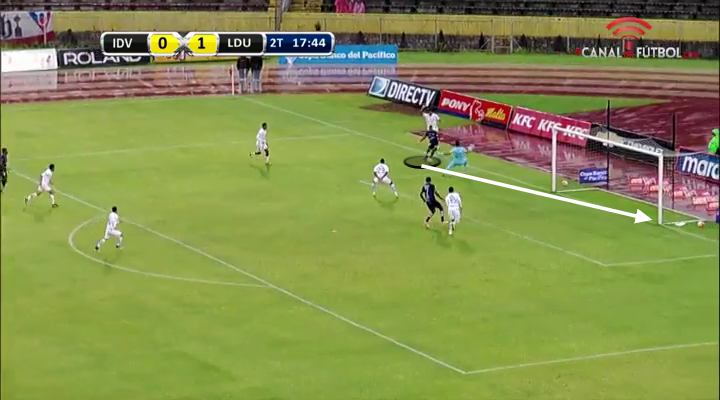 The striker holds the ball up well and quickly releases it to Arce who is motoring down the left flank to exploit the space left by Guayaquil City’s high line. Arce has the pace to get away from the back-tracking defender but there is still another covering defender rapidly coming across. Demonstrating plenty of composure, Arce nudges the ball to the side, sending the onrushing defender careering past him, before slamming the ball across the keeper and into the bottom corner of the net. Rather than just a pace merchant, Nepito is also an inventive dribbler and loves to take players on in one-v-one situations. His style of dribbling is quite raw and he doesn’t always look to have the ball firmly under control but he is instinctive and resourceful which can be extremely deceptive for defenders who aren’t quite sure what he’ll do next. 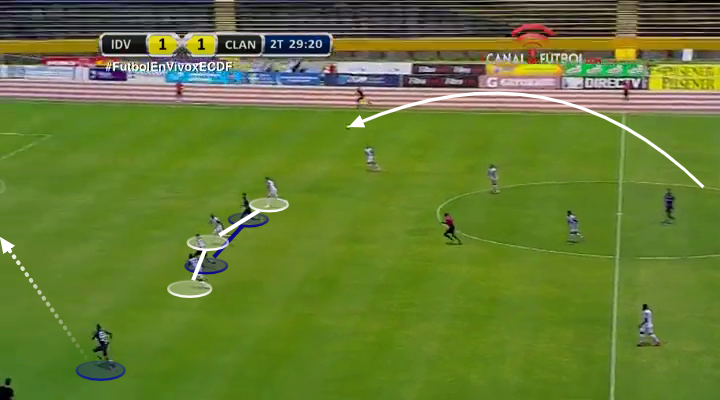 In this example we see the combination of Arce’s pace and instinctive dribbling at its best. 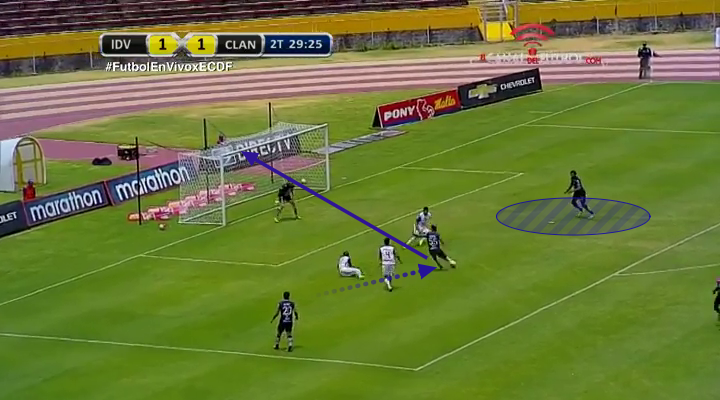 Using his pace to run onto the ball over the top, Arce has a yard or so of space but is being closely tracked by Luis Canga, while the ball is quickly bouncing towards the byline. Arce reaches the ball close to the byline and, with his first touch, flicks the ball with the outside of his right boot. The defender doesn’t expect this movement across him and is wary not to give away a free-kick or penalty, potentially also thinking that Arce won’t be able to keep the ball in play. Arce, with another touch from his right foot, does just about keep it in play and steadies himself to assess the situation. With the goalkeeper bearing down on him and from a very acute angle he manages to shoot through Viteri’s legs and into the net for the equaliser. Moments of impish impudence like the example above or the back-heeled goal against Barcelona highlight why he is such a captivating talent. As you would expect from someone with the aforementioned attributes and skills, Arce is often on the receiving end of some hefty punishment from opposition defenders. This does result in him winning a lot of fouls but often you get the impression he is sometimes looking for it too much. Combined with his relatively slight frame, his lack of strength can occasionally see him knocked off the ball a bit too easily and it is an area that needs improvement, especially if he is to move to a more physically demanding league. There is also the danger of him becoming too predictable if he is so one-footed and defenders will quickly get wise to him looking to use his right foot. Having said that, we must remember that he is still only 19 and has only had one proper season under his belt so variation in his game which will something that hopefully comes with time and further experience. In the short term Arce will be hoping that he has surely done enough to nail down a starting position for Independiente del Valle and prove that he can bring consistency to his performances. It is still early days and he is in a great club to develop his promising, if raw, skillset. Given that we haven’t seen Arce as a guaranteed starter, the sample size is still small and its therefore difficult to analyse just how far he can go. Ecuador produces an abundance of pacey, direct wingers so he will have to prove that he offers something different so that he stands out from the crowd. 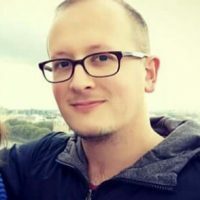 Having said that, the early signs are promising and there is definitely a feeling among fans that he has that extra je ne sais quoi that could elevate him to the next level.